Have you seen the latest issue of RCI magazine yet? Have you seen the latest issue of RCI magazine yet? 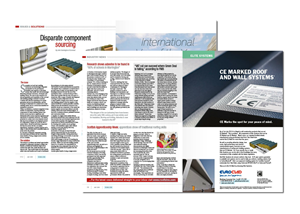 As industry leaders we were approached by its editor Matthew Downs to provide some helpful information and advice on two very hot topics; CE Marking and System specification versus disparate component sourcing. On page 12 is an article exploring the latter topic, specifically focussing on the many benefits of a single-source solution such as Elite Systems. And if you turn to the first page of the cladding and sheeting section on page 22 another Euroclad-penned article explores the implications of CE Marking to metal roof and wall cladding systems. Click here to view the July issue of RCI magazine online.